FOR MANY, THE name Bolwell will likely invoke memories of a quirky sports car that used to be made in Australia. With a fibreglass body, the Bolwell became something of an icon in the local motoring world. Since that time, the company has successfully expanded into different industries, in such diverse fields as medical applications to heavy transport. 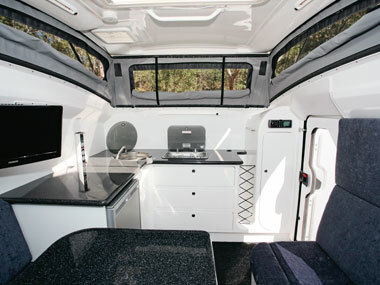 The RV industry has used a number of Bolwell mouldings and vacuum-formed products extensively over the years. 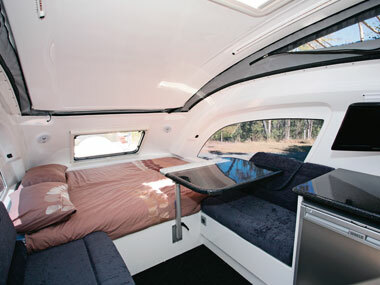 But in more recent times, the company has gone as far as to design and manufacture its own RV - the Edge. Deciding what RV category the Edge fits into is where things get a little difficult. It's more or less a caravan, but with enough camper trailer characteristics to make you think twice about that description. However it's defined, the Edge is a very sleek and purposeful-looking unit. In terms of construction, the Edge's somewhat futuristic look is achieved by using a fibreglass/synthetic composite body structure - called Endura-Core - that is frameless but nonetheless rigid. 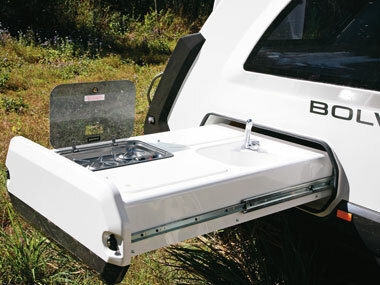 The Bolwell RV team believes the result is a strong, impact-resistant, lightweight, body. 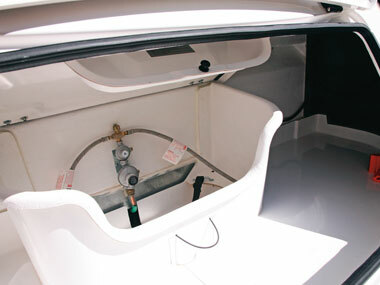 Single-piece structures for the body and front pivoting roof mean the rig is also waterproof. There are two non-opening windows on the side, as well as a large opener at the front. Underneath the body, the hot-dipped galvanised chassis and drawbar may appear unusual at first, but are actually a fairly standard box section setup. Our Edge came with a Treg poly block hitch, but a standard coupling is also available. The seemingly short drawbar is relatively uncluttered, with only the hitch and handbrake fitted. Two gas cylinders hide in a separate bin in the front boot - something that has a surprising amount of space given the size of the rig. 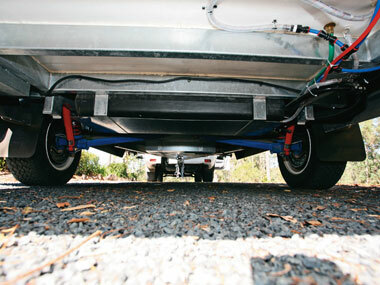 At the rear, there is no steel bumper so the spare fits neatly into the fibreglass moulding. Riding on independent trailing arm suspension fitted with coil springs and shock absorbers, the Edge has a solid ground clearance. Two 80L water tanks (one optional) are fitted between the rails and are protected with galvanised sheeting, rather than the tougher moulded polyethylene. 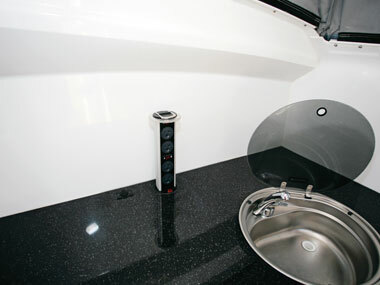 Like most quality caravans with a travel height as low as 2.4m (7ft 10in), the Edge has a lifting roof, but it's neither a pop-top nor a rising-roof design. Rather, it's hinged at the front and clipped at the back, campervan style, and is very easy to operate by just undoing the rear wall clips. Other than opening the front stoneguard/window and lowering the corner steadies, that's about it for set-up. 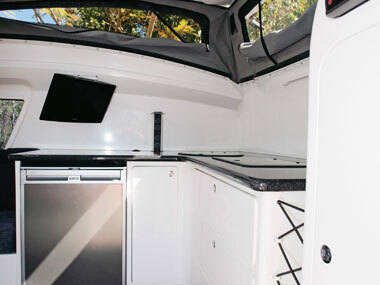 Another camper trailer feature is the optional external slide-out kitchen bench (there is also an internal kitchen). Made from the same moulding material as the body, the external kitchen comes with a two-burner cooktop, plus a sink and storage compartments. A small (optional) awning is also neatly tucked into a moulded recess, but while it's designed to cover the external kitchen, it fails to cover the entrance. On the inside, the Edge is quite a simple layout. The front is occupied by an east-west queen bed, a small dinette sits across the middle and the kitchen bench takes up the rear. With the roof raised, the living area has a generous internal height of 1.96m (6ft 5in). 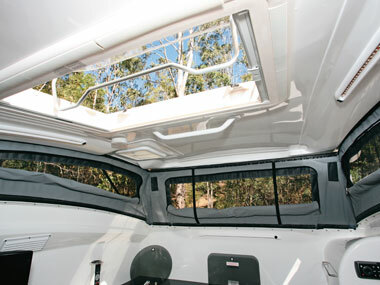 Although the side windows don't open, the front window, large roof hatch and three screened windows in the roof gusset provide enough airflow. Some may have a problem with the sealed windows, but things were fine on the mild day of our test. Measuring 2x1.45m (6ft 7in x 4ft 9in), the bed is a very snug fit across the front. And I found it slightly odd that although it comes with a 12V socket and sound system speakers on either side, there are no individual reading lights. Two sideways-facing seats and a Lagun swivel-leg table make up the dinette. While this versatile and steady setup is a good design for this van, it can also be removed easily when not needed. A flatscreen TV is fitted above the offside seat. This may not be the best location for the person in that seat, but there aren't many other suitable places, except maybe in the front corner above the foot of the bed. Two overhead LED strips give good illumination. Fitted into the corner, the well-equipped kitchen features an under-bench 137L Waeco fridge, two-burner cooktop and round stainless steel sink, with no drainer. I'm not sure why, but Bolwell lists the two-burner cooktop as "optional". The kitchen is also home to a couple of unexpected features. The first is the surprising amount of bench space the designers have managed to squeeze in. The other is the powerpoint pedestal, with four outlets, that can be pushed below bench level when not needed. 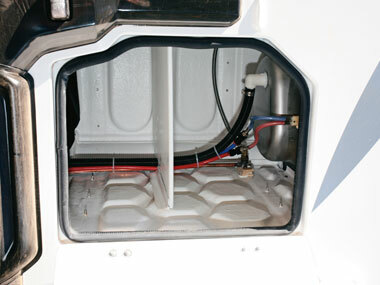 Two 12V sockets are also fitted into the benchtop. Storage consists of three drawers, one cupboard, a small wardrobe and a netted compartment, while the offside corner space is home to an external bin. Another LED strip does a good job of illuminating the bench. At 4.75m (15ft 7in), with an ATM of 1640kg, the Edge is not a particularly large unit, and along with its relatively narrow width of 2.2m (7ft 3in), it's ideal for bush tracks and/or relatively lightweight travel. The Edge is quite a unique caravan, especially to the unsuspecting eye. The van's apparent size belies what is actually fitted into the rig. And while it doesn't have any sort of bathroom, it does come with either an optional external shower or fully enclosed annexe. 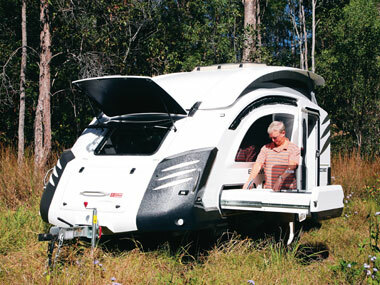 All this means it is not going to suit every traveller, but camper trailer enthusiasts who don't like flapping walls, or caravanners who prefer smaller rigs, are going to be interested. 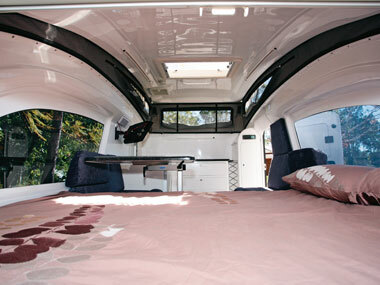 Whichever way you look at it, the Edge features enough home comforts to make it a very attractive offroad unit. 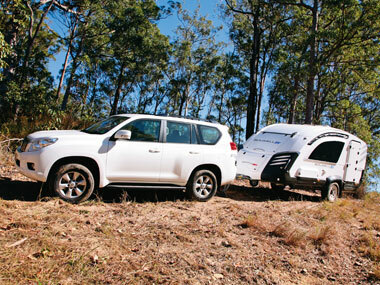 Source: Caravan World Mar 2012.